Do you guys remember one of our fav couples, Rhandi + Jon? We shot their wedding at Callanwolde less than 2 years ago… it was featured in a couple of magazines and even on the cover of a magazine as well. We had magazine reps fighting over exclusivity of their wedding… it was crazy! So, as you can imagine, we were stoked when they contacted us again for their new season of life. We have seen this couple when they were engaged, married, and now they’re going to be parents! CAN’T WAIT to see their precious baby. Ah… I just love seeing our couples grow more in love with one another and how blessed are we to be able to be part of those very special moments of their lives and actually capture it? When they announced their pregnancy, we were so happy for them! They wanted to do a maternity shoot and when we suggested a waterfall, they were all for it. Craig researched a lot and found this little gem in the North Georgia mountains. It was a little drive up there, but it was so worth it! It’s only a quarter of a mile hike to the waterfall, so it wasn’t bad at all. The best thing about this waterfall is that you get to be so close it. You don’t have to observe it from afar, which is why it was exciting for Craig to take photos here. And… it’s not a tourist area, so only 1 or 2 people came by when we were shooting. Rhandi as always was so beautiful in her dress and um…. I must say that I did not look like her when I was prego. I gained at least 50 pounds with my first, and Rhandi looked like she gain like maybe 5. And what a trooper of a mama she was! It was pretty cold this day, but she fought through it so well and hiked to the waterfall like it was nothing! She already began having Braxton Hicks contractions, so we were very mindful of her baby. I had those with all three of my pregnancies, so I completely understood what those felt like. When we got to the waterfall, Craig looked like he found a treasure or something. 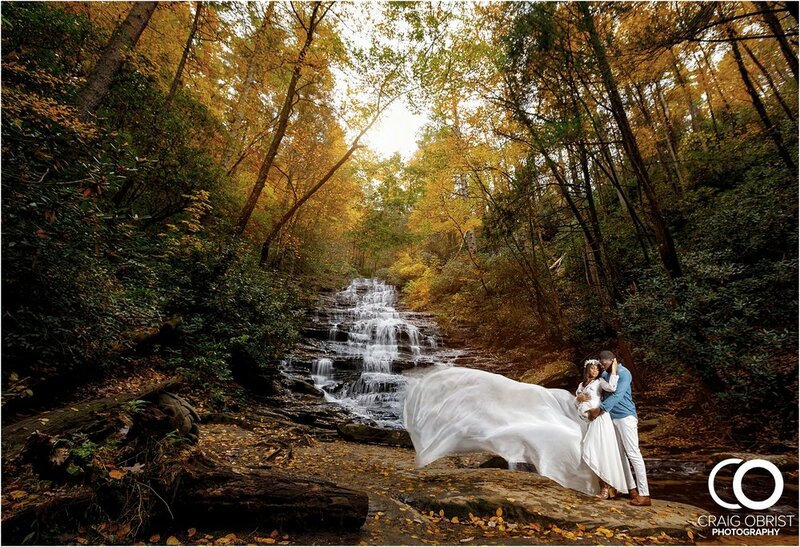 He was in a photographer’s dreamland… A dream of the most picturesque location with the most photogenic couple. I mean, what more could you ask for as a portrait photographer, right? Rhandi + Jon, thank you guys so much! It was wonderful to see you both again, and we can’t wait to meet your little one very soon. Our sincere congrats to you guys. You’re going to be incredible parents!